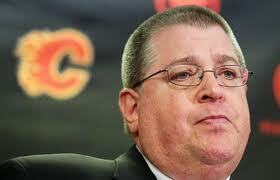 The Flames current General Manager is Jay Feaster. He has just completed his first full season as the Flames GM, and has a Stanley Cup ring from his days with the Tampa Bay Lightning. Assuming ownership has confidence in Feaster, here are some scenarios that may help reinvent the franchise. 1. The decision makers need to be replaced. The scouting staff and coaching staff must be cleaned out. Too many mistakes in talent identification have been made with this group in the past to sustain confidence in their decisions. Also, there needs to be no ties to players, and prospects within the system that may lead to continuing over valuing of players. Head Coach Brent Sutter’s current contract is about to expire at the end of June. Sutter and the team announced they arrived at a mutual agreement to conclude his duties in Calgary. The team should have replacements in head scouting, and coaching in place as soon as possible heading into the draft. 2. A new philosophy needs to be developed, and embraced. The team needs to commit to re-stocking the franchise with draft picks, young players, and prospects. There will be several more years before the Flames return to the post season, but they will acquire several high draft choices in that time. The draft picks are only useful if the Flames improve their drafting record. Both the AHL, and NHL level franchises are desperately thin on youth. A new culture needs to be established within the organization at every level, from scouting, to coaching to the locker room. 3. Purge the roster of veterans. The team has several roster players whose contracts are expiring and will become unrestricted free agents. Olli Jokinen, Lee Stempniak, David Moss, Tom Kostopulos, Corey Sarich, and Scott Hannan all combine to free up six roster spots, and $11.7 million in cap space. There are also 11 players with some variation of movement restriction that will pose some challenges. Most notably is team Captain and franchise player Jarome Iginla. He has a NTC and loves Calgary, and Calgary loves him. Would he waive his NTC to avoid a rebuild, and play out his career on a contender in pursuit of the Stanley Cup? Only Iginla knows that. CBC’s Elliotte Friedman recently penned a creative article on how it may happen that Iginla would accept moving to a new team. Star goalie Miikka Kiprusoff’s NTC expires after this season as well. That only leaves seven players with no trade clauses and non expiring contracts, Mike Cammalleri, Alex Tanguay, Matt Stajan, Curtis Glencross, Jay Bouwmeester, Mark Giordano, and Anton Babchuk. Between their NTC and high salaries, expect all these players to remain with the Flames. 4. Do the unthinkable, and trade both Jarome Iginla, and Miikka Kiprusoff. Before I break down potential starting trade scenarios, keep in mind historically similar deals have yielded significant returns. Peter Forsberg who was 33 at the time of his trade to Nashville brought Scottie Upshall, Ryan Parent and a first, and third round picks. When Toronto did the unthinkable and traded Wendel Clark, they got back Mats Sundin. Finally when the Bruins also did the unthinkable and traded Ray Bourque (And Dave Andreychuk) to Colorado, they got Brian Rolston, Sammy Phalsson, Martin Grenier, and a first round pick. At that time Bourque was 39, and played one more season with Colorado. Let’s look at Iginla first. Although Iginla does have control over where he goes which limit the options, there are options. There are conditions that would need to be met for Iginla to consider a trade. 1. He would have to go to a contender. 2. The separation would have to preserve his legacy in Calgary. Detroit offer – Two or three prospects from a group of Brendan Smith, Tomas Tatar, Gustav Nyquist, and Petr Mrazek and a first round pick giving the Flames a solid prospect in each position. Los Angeles offer – Jonathan Bernier, and one of Tyler Toffoli, Derek Forbort, or Andrei Loktionov giving the Flames two top prospects. The Kings solve their scoring problems. New York Rangers offer – Brandon Dubinsky, and Chris Kreider. An alternate solution if the Rick Nash plan fails. Philadelphia offer – Jakub Voracek, Erik Gustafsson, and Sergei Bobkov again giving the Flames three solid players in each position. Iginla puts the Flyers over the top. Pittsburgh offer – Two or three of their top prospects either, Beau Bennett, Simon Despres, Joe Morrow, or Eric Tangradi. Iginla and Crosby have played together internationally and are deadly together. Washington offer – Bradon Holtby, Marcus Johansson, and the 11th pick. A steep price to pay, but with Alex Semin potentially leaving there is cap room. Also with Evgeni Kuznetsov potentially coming, this would stack the Capitals. Calgary gets a goalie, a top six center, and good draft pick. Now let’s look at Kiprusoff. Kiprusoff has no say in his destination, but it has to be to a team desperate for goaltending that thinks they can win, or needs to win now. Potential suitors include Tampa Bay, Toronto, and Washington. 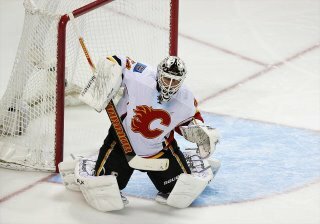 For Kiprusoff, Calgary would be seeking draft picks, and prospects. Tampa offer – The 10th pick in the draft, The Flames would love to unite the Reinhart brothers. Tampa has accumulated several picks for this upcoming draft, and with Dwayne Roloson at 42 years old, and Mathieu Garon both unable to get Tampa into the playoffs Kiprusoff could be the difference. Toronto offer – The Leafs wont part with their top pick (5th) but would combine two or three prospects such as Tyler Biggs, Brad Ross, Korbinian Holzer, Greg McKegg, or Stuart Percy. This offer restocks the Abbotsford roster for the Flames, and gives the Leafs the best goaltending they have had since Eddie Belfour, and Curtis Joseph. Washington offer – The 11th pick, giving the Flames a chance to draft Griffin Reinhart. The trading of both players is key to the future of the franchise. The Flames will want to avoid a situation like the one in Toronto where the organization was unable to expedite their rebuild by trading Mats Sundin. Not only did the Leafs get nothing for Sundin, there were hard feelings due to the situation when he left. The Flames currently own the 14th overall pick in the draft. Potential players who could be available are; Jacob Trouba D, Hampus Lindholm D, Teuvo Teravainen RW, Zemgus Girgensons C, Derrick Pouliot D, Radek Fakas C, Malcolm Subban G.
Now insert the assets acquired from trading Iginla and Kiprusoff, and the future begins to look a little brighter. Even though Iginla only has one year remaining on his current contract he would still fetch a handsome return, enough to begin building a franchise around potentially. Because Iginla will dictate where he will go, it is safe to assume he will resign with that team to finish out his career there. Combine that with the return from Kiprusoff who has two years remaining on his contract and you can add some future pieces that will have an immediate impact on your minor league team. After one or two more seasons of high draft choices and prospect development the team will be turning the corner. No question, things will get worse before they get better in Calgary. But there should also be little doubt that the time has come to burn the existing identity and foundation of the franchise to the ground, and build a new era of Calgary Flames from the ashes.